Sold the last of the walnuts for this year. 97 pounds, which paid for the trip there then over to the Amish stores and back home . Also found one of the Amish over there that sewed a seam back up in my 3 year old work boots. To good to throw away yet. Bought a dab of stuff for the storeroom. Cool on the "free" round trip. Did the Amish person use a sewing awl or a machine? 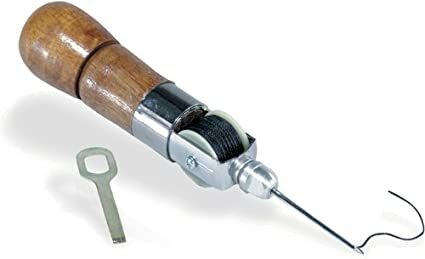 I've got an antique sewing awl like this one but really want to get a new awl. He used a machine. I'd say the open arm was about 24". Turned by hand, as there was no motor mounted to it. Yeah I suspected a machine but the power could have been an acceptable motor, pneumatic or hydraulic, depending on sect. Yes. It was a belt drive, but no motor. And it was mounted on an old treadle cabinet, but that belt wasn't hooked up either. Wow, I have thought that the treadle would have been acceptable power. Probably is, but just hasn't hooked it up. Looking around, he had other tools that were there, but weren't hooked up/finished. Messy shop, he looked to be too busy with other stuff. I keep sorting and packing my stuff for moving, so now I'm quite well informed of what I even own. Finishing some blacksmithing orders, tried some new techniques. As time pushes me, I've developed some more effective ways to do certain things. Made a pair of stag grips for my .22 revolver which by itself is not a prepping deed at all, but it's good to have practice in all sorts of gunsmithing, including the making of new grips. Preparing house for winter. LP tank filled. I'm cutting firewood. Spending more time cleaning up brushy spots, mowing brush, and burning said brush and tree tops. Love this topic! Today of course I took care of all the critters here on the farm and picked up a part time fun job to make $$ to buy more critters! Going to a goat/poultry auction Saturday! Last week I canned up 24 pints/quarts of meat that I got on sale, snagged a bunch of potatoes both Irish and sweet on sale and planted some stuff in my greenhouse mostly greens. Got the garden fenced in finally and hubs cut a truck load of wood for me to split. Ya I can swing a 16# maul! AND SPLIT the wood! Bred and checked the rabbits for more meat. Friday we are picking up a Faraday cage for our generators and electronics. A 10 x 10 metal shed. Besides the normal stuff I am now taking a Dairy Goat management course on line and studying the constitution. I love walking into my "wee wally" and knowing I have everything I need without having to run to the store! I would love to post pic but i have not figured out how! Need more posters in here like you!! Bought a pair of brand new leg protectors for EOD forces. Extra good price, especially considering the quality of the item. They protect the leg from above the knee all the way to the toe tips. Allow easy movement. They're not ballistic, just provide percussion protection. Profiled plastic plates and padding. In the first place, I bought them to protect my shins in the forecoming moving and house rebuilds/repairs, as I have a problem healing those parts, but the armor would be great in various kinds of dangerous situations, including fights. I gave myself couple good hits with a pick shaft and hardly felt anything at all through the plates. Also took advantage of free shipping offer of certain local manufacturer of tactical gear, combined with some sale prices they already had and got a bunch of magazine pouches to test them. Looks like they might have finally developed a functional pouch for vz.58 mags. Will see. If I like it, I'll get more. Working on the same here. I've got 5 pork shoulders I got on sale and am making and canning pulled pork with BBQ sauce from them. Also 30 lbs. of white potatoes purchased on sale coming up next. Finish up the pork today and tomorrow then start the potatoes. We do not eat pork but Saturday we are going to a goat/poultry auction and try to buy some turkeys for breeding, more doe goats, and hopefully more hens and rabbits. Understand about eating pork. I love goat but it's very expensive here. Tagine cooking or braising/stewing is a cooking method I love. Just wish I had a larger Tagine. Dutch oven just doesn't make it for me. Canned 16 pints of shredded meat in BBQ sauce this morning. I've got 3 more picnic cuts in the freezer and think I will shred and can them in water or stock so the meat can be used in more than one type/style of dish. Picked up 700 rnds of subsonic .22 that were on sale. Packing stuff for moving has finally pushed me into sorting and organizing my reloading stuff, blackpowder gear, bullet casting and other related tools. Practiced small-scale forging and forge-welding when making an order of 20mm buckles. Done some more fine forging (making miniature lugs and bails for tiny 18th century brass kettles), followed by very careful and fine riveting. Peening tiny rivets on items made of thin, annealed brass that you don't want damaged, really hones your hammering precision. Forged a different type of axe I never tried before. Not bad, not perfect yet. Also tried (and succeeded) cast tin inlay on wood, which is mainly decorative technique, but used on simple knives, it can nicely improve the connection between blade and handle, as the tin can also create sort of bolster/guard and pommel, not just decoration. We installed new smoke detectors. I know, how cool. But the old ones were old and it's one of those things we put off probably more than we should. I hate electrical work. You have the entire attic to install any wire anywhere and it has to be in a putzy little box that I can barely get in and screws that are guaranteed not to fit right. Over the last few days I've added 16 pint jars of pineapple in syrup to the stash and started building more shelves. Moving to my new home is fully on...among other things, I'm already checking for good spots to store long term supplies ans to build a gun vault room. Added 40 pint jars of potatoes to the stash. We'll be doing tater and onions after we get the wood under control.